It’s the last installment in B2’s birthday series! You can see parts one (hurricane popcorn!) and two (chicken katsu plate lunch!) here. 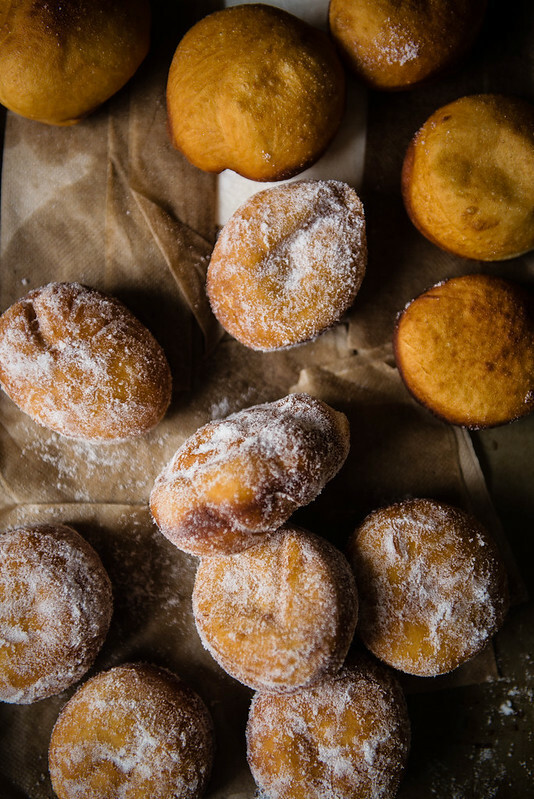 These babes aren’t something that B2 actually ever requested I make — I think I mentioned homemade malasadas once, way back, and B2 chewed on the idea and said it just sounded like too much work to make at home. Usually, when he says he’s not so into something, I take it at face value (or else things happen like I know you said you didn’t want Oreos but, Oreos! And they were on sale! and then I have a pack of Oreos to finish by myself. It’s true, there are worse problems to have.) But I figure the thing about birthdays is that, hey, it’s nice to get something you didn’t have to ask for. And there are things that you might like a lot more than you suspect. 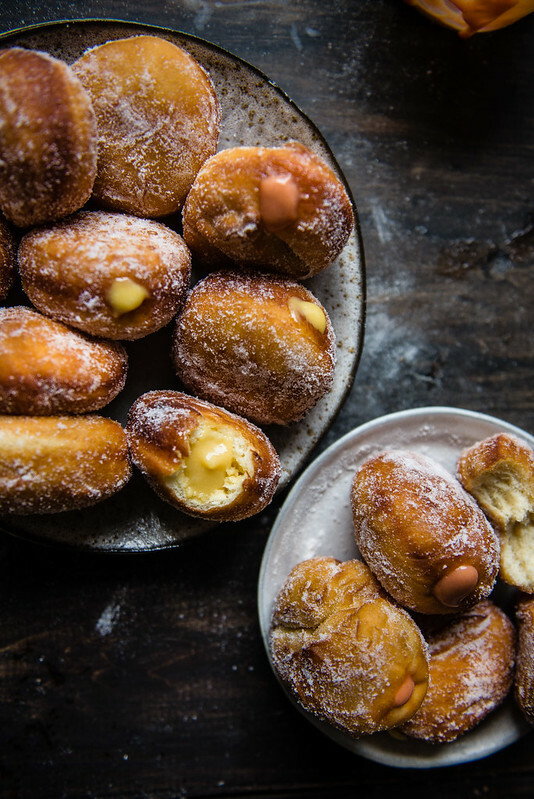 As it turns out, a platter of warm, yielding, airy malasadas filled with smooth pastel curd, the kind that brings back B2’s childhood memories of school carnivals and afternoon runs to famed neighborhood bakeries, is one of those things. 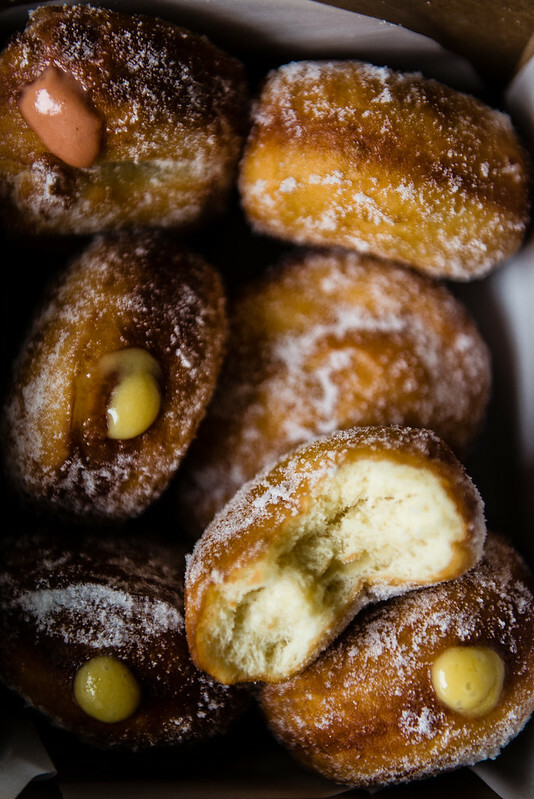 In case you are (like I was, for most of my life) unfamiliar, malasadas are a fried Portuguese-style donut popular in Hawaii and elevated to mythic standards by Leonard’s Bakery in Honolulu. B2’s perfect mama wasted no time with introducing malasadas to me the first time I visited, and from my first bite I was enraptured. Golden-brown and sandy on the outside from a generous dusting of granulated sugar, they are euphoric inside, impossibly airy, pliant and soft, light and fluffy but with just enough chew. Leonard’s offers plain, cinnamon sugar, haupia-filled, and chocolate-filled malasadas on the regular, plus a rotating flavor of the month, and though the donuts are so incredibly good that most of the time I opt for just plain, we were absolutely obsessed with the guava flavor they had one January. So when I sought to recreate these at home, a guava filling and a lilikoi filling were the two that I chose. You can use concentrate to make the curd fillings if you can find them, or reduce juice into your own concentrate by simmering for a hot minute — either one will work wonderfully. All in all, B2 wasn’t wrong — these aren’t the quickest dudes to make, and they require a little doing, but what’s a birthday if not a cause for a little work for a lot of celebration? The guava filling was every bit as beguilingly sweet and fresh as I remembered it, and the donuts are wonderfully light, chewy, and soft. We left some of these (what few we could part with) out in the entrance of our building for our neighbors, and they were gone within the hour. I hope you enjoy them as much as we did! P.S. It’s #nationaldonutemojiday! You can find the whole donut extravaganza here on a Tumblr just for donuts, or by searching for the hashtag. And, even though these are birthday malasadas, a couple of the extra squishy ones are for the fabulous Lyndsay at CocoCakeLand — she is a lover of Hawaii and donuts and a badass fighter if I ever saw one. If you don’t follow her blog, you must! Hop on over for the most gorgeous cakes and for more on why these days, even more so than usual, Lyndsay is truly an inspiration inside and out. You’re a rockstar, my friend. P.P.S. Oh gosh, bear with me — just one more thing to say! It’s really late or very early, depending on how you flip it, and I’m all topsy-turvy from a nonstop couple days full of work (boo) but also belly-laughs (yay) and inexpressibly wonderful people (yay-er), and I’m still not convinced these words are true as I’m typing it, but I learned yesterday evening that — all, completely, one hundred percent, two hundred percent thanks to you — Two Red Bowls somehow won Reader’s Choice for Most Delicious Food at this year’s Saveur Blog Awards. I can’t remember the last time I was more shocked, humbled, or overwhelmed, and hopefully I’ll have more coherent thanks to give you later, but I just had to write one great big thank you for being the absolute best, best blog friends and readers I could ever ask for. It’s still weird to me to even type “readers” like I have any, so thank you for making that and so much more possible. Thank you. And congrats to all the other winners and finalists! These homemade versions of Leonard's mythos are tweaked from two Leonard's Bakery recipes on Saveur and Food Network, with more help from the exceedingly lovely Alana at Fix Feast Flair and Michelle at Hummingbird High. The Saveur version of Leonard's malasadas uses a mixture of whole milk and half-and-half, but I usually only have cream, so I simplified it a bit to replace the half-and-half with a little less cream and a bit more whole milk. At that point, I was delighted to find that this actually isn't so different from Hokkaido milk bread (go figure!) so I incorporated an overnight rise to make things easier and to give the flavor more time to develop. 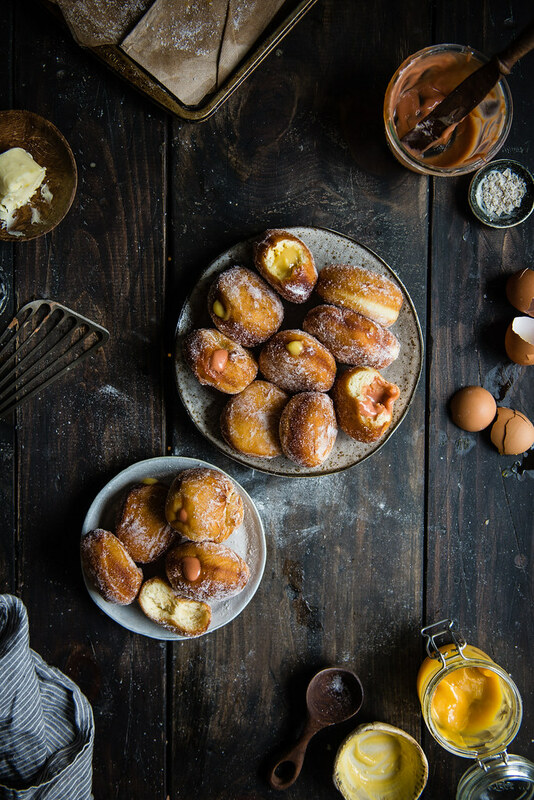 Alana and Michelle's recipes also use a bit of white vinegar, which I loved and found made the malasadas noticeably lighter and springier. Finally, I found that frying the donuts at a bit of a higher temperature, like Michelle calls for, makes the donuts both lighter and quicker to fry. Prepare the dough: Heat milk to about 110 degrees or lukewarm to the touch. Sprinkle the yeast over the milk and set it aside for 5 to 10 minutes for the yeast to activate. The mixture should foam. In the meantime, sift together the bread flour, salt, and sugar in a large bowl. In a separate bowl, beat the eggs vigorously until foamy. When it’s ready, whisk in the yeast mixture, melted butter, and cream until well-combined. Finally, whisk in the vinegar and vanilla extract. Add the wet ingredients to the dry and stir with a wooden spoon until the mixture forms a loose, shaggy dough. Switch to using your hands and knead for 4 to 5 minutes, or until the dough forms a smooth ball. Place the dough in a large bowl with plenty of room and cover with plastic wrap or a damp towel. Let proof until doubled, at least 2 hours at room temperature or overnight in the refrigerator. If doing an overnight refrigerator rise, cover more tightly; the dough should be fine for up to 24 hours in the fridge. Make the guava filling: If you're using juice and not concentrate, you will need to reduce the juice for a stronger guava flavor. To do so, bring 2 cups guava juice to a boil in a heavy-bottomed saucepan over medium-high heat. Reduce heat to medium-low and let simmer until reduced to 1/2 cup, about 20-30 minutes depending on your stove. The end result will be thick and syrupy. Remove from heat and let cool. Once completely cool, whisk in the eggs, egg yolks, sugar, and half the butter (1 1/2 tbsp) over medium heat. (If you want to be extra sure the eggs won’t curdle, use a double-boiler.) Cook, whisking constantly, until the curd starts to thicken and begins to stick to the bottom of the pan. This will take about 5-7 minutes. Reduce heat to low and continue to cook and whisk. When large bubbles begin to form and pop in the curd, whisk for another minute over the heat, then remove. 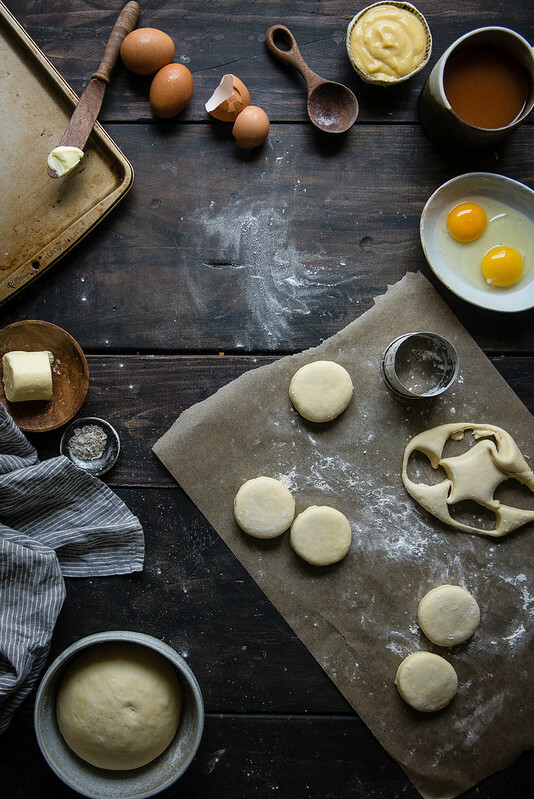 Shape the donuts: The next day or once the dough has doubled, line two baking sheets with lightly floured parchment paper and set aside. Turn the dough out onto a lightly-floured surface and roll it to about 1/2-inch in thickness. Cut the dough into 2-inch rounds or 2-inch squares, reusing scraps as needed -- you can also simply pinch off balls of dough, about the size of golf balls, and pat them gently into circles. Place the dough on the baking sheets at least 3 inches apart, cover loosely with plastic wrap or damp towels and let proof again until doubled, about 2 hours. 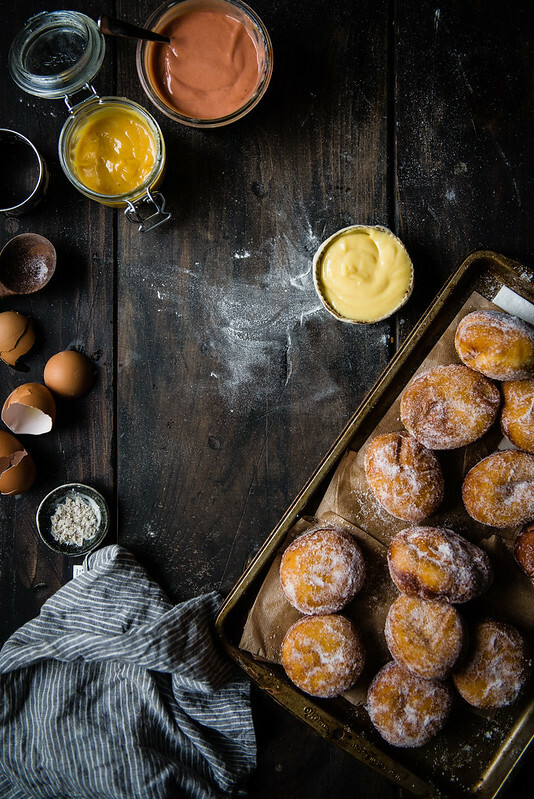 Fry the donuts: Prepare about 1/2 cup granulated sugar in a shallow bowl and set aside. In a heavy-bottomed saucepan, heat about 2 inches of oil to 375°. Use a fish spatula or slotted spoon (or both together) to gently pick up a donut and place it in the oil. Cook, flipping once, until puffed and dark golden brown, 1 to 2 minutes per side. Drain on napkins or a baking sheet and let cool until just warm to the touch. Toss gently in granulated sugar until coated. 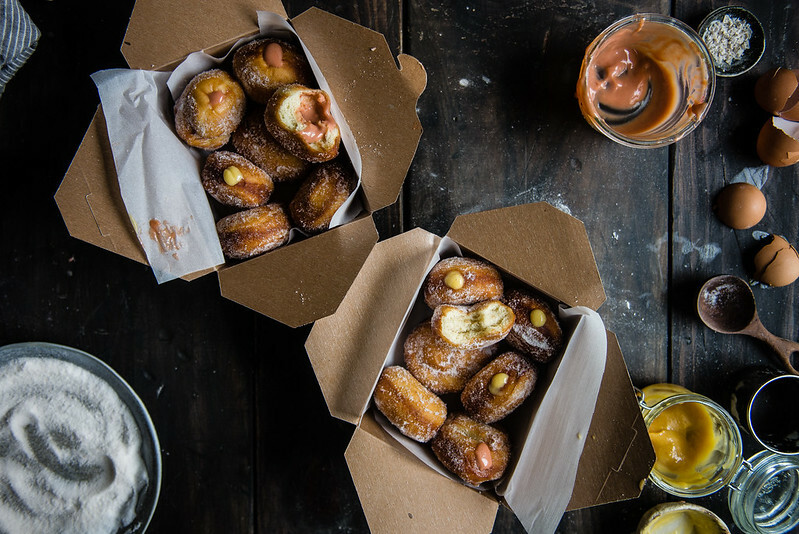 Fill and serve: To fill the malasadas, use a small paring knife to cut a slit in one end of the donut. Insert a chopstick or skewer through the hole and move it side-to-side to create a hollow for the filling. Fill a pastry bag with the custard of your choice and fit it with a small or medium tip (I used Wilton’s No. 5). Insert the tip into the donut and gently fill until you can feel the donut start to feel full. (For awesome step-by-step photos and instructions, see Alana’s post!) Repeat with remaining donuts and fillings, then enjoy immediately! If you find that your milk and yeast mixture will not foam, add a teaspoon of sugar to the milk, stir and let it sit for another few minutes. If storing the dough in the refrigerator for an overnight rise, cover more tightly with plastic wrap to avoid drying out. For the fillings, I found 3 cups of juice to work better for the lilikoi because the juice I had was a little more diluted, so reducing it further yielded a stronger flavor, and 1/4 cup sugar was more appropriate because the lilikoi was a bit more tart as compared to the guava juice. 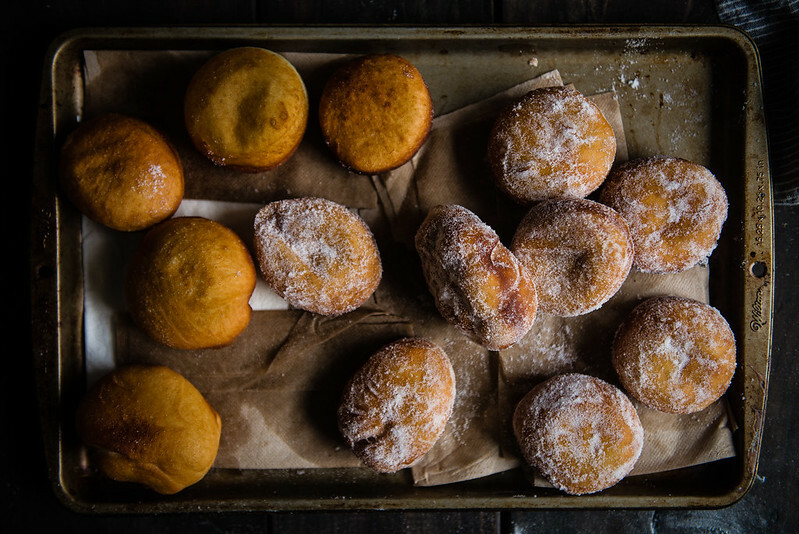 Finally, don't fret if the malasadas are crisp when they first come out of the fryer. 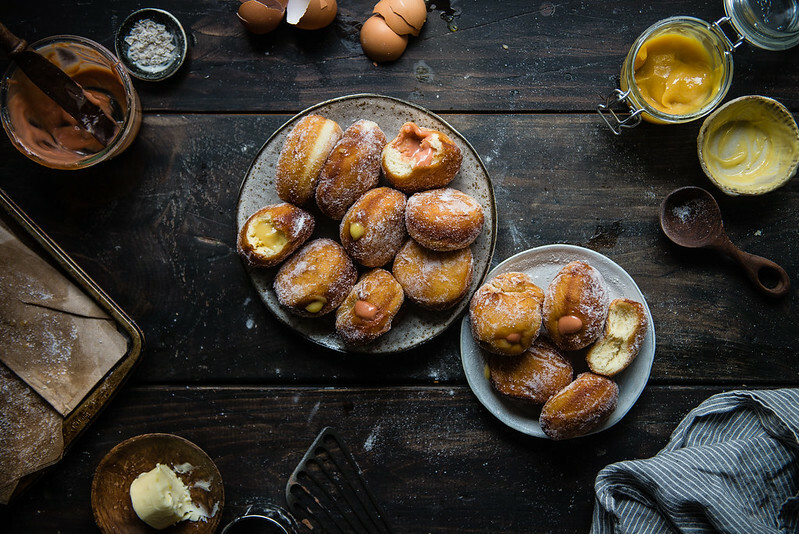 Upon sitting and cooling briefly, they will soften into the plump, airy malasadas you know. « chicken katsu, mac salad & rice // a birthday hawaii plate lunch! YAY Cynthia!! Congrats!! Seriously it was NOT a surprise – your food always looks so delicious, how could people NOT vote for you? 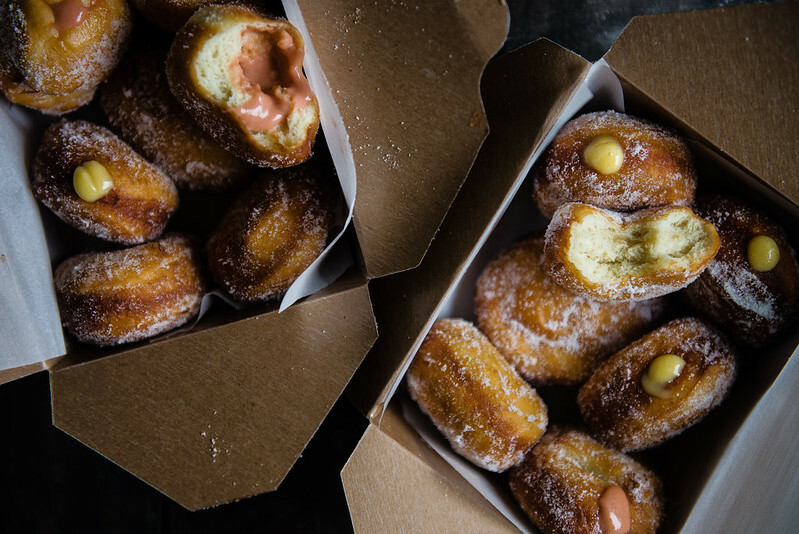 And these doughnuts – omg. They look delectable with the filling oozing out… Oh my, B2 is a lucky lucky man. THESE ARE SO GORGEOUS. good lord. and that guava filling?! whaaaat. omg I could eat my weight in guava curd, it is SUCH a problem!!!! I’d trade you for those grapefruit lovelies you made last year, though!! They looked in-cred-ible. lastly, but probably firstly, biggest, biggest congrats!!!! so, so, so well deserved dear!!!! bigggggg hug. I told you i knew it!!!!!! You are and will always be the sweetest, Steph!!!! I appreciate it more than words <3 Miss you lady! amazing!! wish i can take a bite out of it! 😉 i still have your hokkaido milk bread as something i want to bake – i always end up getting the ingredients and then never find the time and the milk goes bad x( but it’s still on my to do and i think i may just want to try this out too! these are the times when i wish there were more hours in the day! happy weekend! You are totally deserving of the award. The way you take such care with the recipes, photography and the words of contemporary wisdom are only a few reasons you stand out. I really hope that even with such a busy life, you continue to brighten my day with food! For these doughnuts! Love B2 taste! These pillows of deep fry heaven with a tangy creamy filing are the perfect way to finish a meal. Holy moly, not only do these look absolutely dreamy and I want to eat all of them, your photos are outstanding as usual. Congrats on your well deserved win too! malasadas are divine. i only had un-filled ones but i think i would like the ones with passionfruit guts best! aaand if you love guava pairing guava jam/paste with cheese is delicious. sounds odd but its like the Brazilian version of membrillo/quince paste + cheese people eat in Spain. These look and sounds amazing! 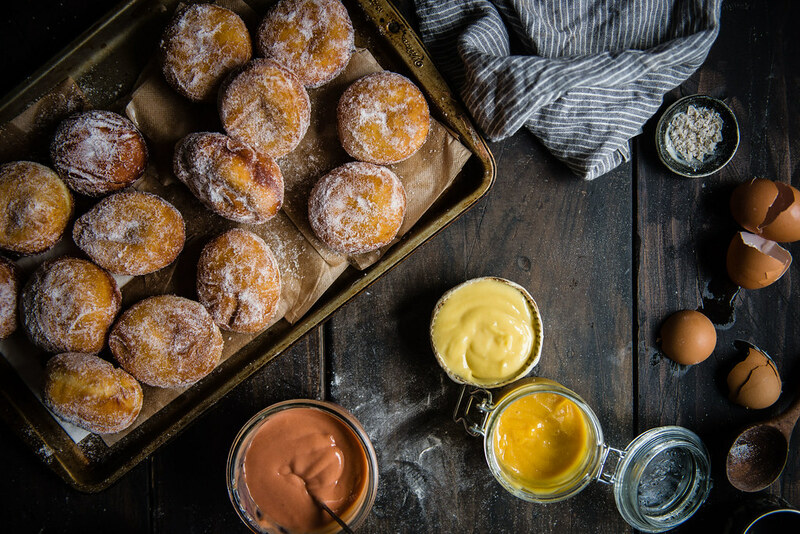 I love the idea of tart passion fruit filling and sweet guava with the pillowy donuts…yum. Also, congrats!! Oh my glob, Cynthia! This is amazing and I kind of really want to eat my screen. Malasadas were always my favorite part of Punahou Carnival (has B2 mentioned this at all??) but I’m thinking they need to start adding guava and lilikoi filling!! CON.GRA.TU.LA.TIONS!!!!! Omg what’s happening to us here!! Seriously, we should have a Skype celebration where you bring these donuts, and molly her moose cake, and Steph her chicken wings, and everyone else who’d like to join, and I bring my bottles of waters which I make best. Then we get super drunk and lick each other on the screens!!! Cynthia, these are AMAZING. Congrats on your big win last night again!!! So excited we finally got to meet, albeit too briefly — it was a little hectic, but hopefully we can catch up when I’m in NYC next! So well deserved, Cynthia!!! I love TRB so much, and I visit it whenever I need a pick-me-up. <3<3<3 Also, happy birthday to B2!!!! I have so many things to say, like HAPPIEST OF BIRTHDAYS ANDY (saying it again cause it’s important), and HOMG these malasadas are everything I’d hoped they’d be and more, and thank you for solving my concentrate problem but what I really really really want to say is just WOOOOOOOHOOOOOOOO YAYAYAYAYAYAYAYAY. You are amazing and I just knew in my heart of hearts that you’d win. Well deserved!! huge huge congrats on your saveur win – so, so, so thrilled for you and you deserve it so much! I hope you had a fun weekend celebrating it + B2’s birthday! B2 is quite lucky, i have to say 🙂 I never heard of Malasadas before but it sure does look stunning. And congrats on the Saveur win, much deserving! Love your work. Gaahh these doughnut photos are just beyond what I can handle. Can we arrange some kind of dessert exchange please? Also, massive congrats on the Saveur award! You’re a rockstar! Oh hi, I wish I could STUFF MY FACE WITH THESE!! And why didn’t we spend more time together in New York?? Wah, wah, wah I wish there was more time, xo xo xo !!! Congratulations on the award! I love coming to your space for food and photography inspiration. Each post is such a beautiful visual story. Any chance we can bake these instead of frying? 😊 Love your blog! Hi Liz! Yes, you can definitely bake them instead of frying, although they won’t taste quite the same — I’d probably shoot for 10-12 minutes at 350 degrees, or until puffy and cooked through but still a bit pale. I haven’t tried it with this dough specifically, but I have a baked yeast doughnut recipe here too and I imagine it would be similar. Hope they turn out for you if you try it! Thank you so much for reading!! I have to say these look amazing! But to me they are not malasadas, they are bolas de berlim. 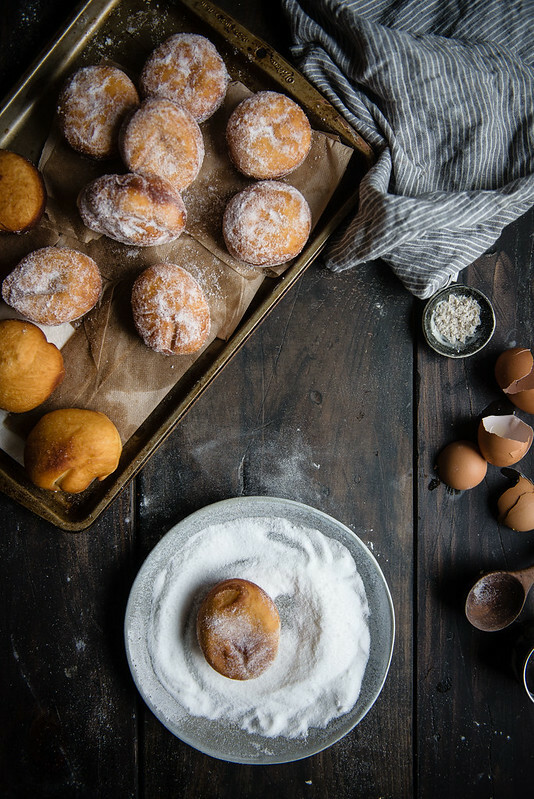 I was born and raised in Portugal and malasadas are only traditional in some regions. However I have not seen them with any filling. These look just like bolas de berlim, with a different filling. Still delicious, I like getting them at the beach or the local farmer/flea market. Hi Ana, thank you so much for commenting and for your kind words! 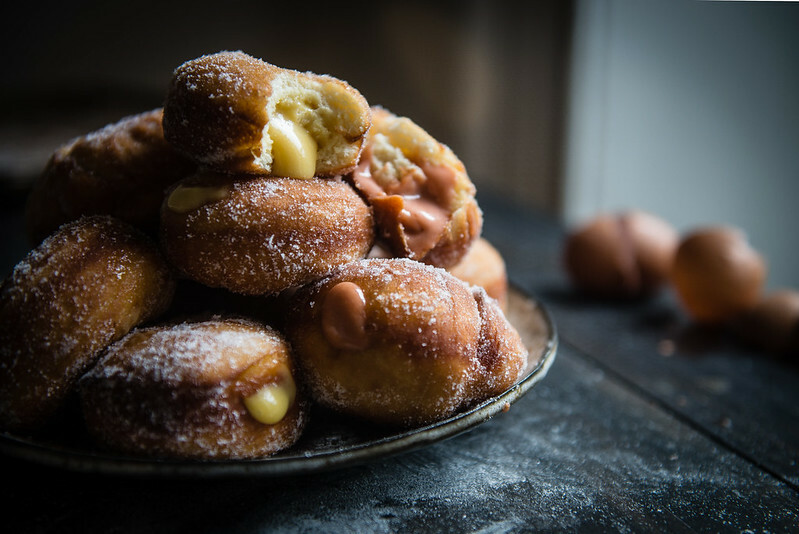 Yes, I imagine these are somewhat different from the traditional malasadas from Portugal — these are meant to be Hawaii-style malasadas, which were adapted over time from the Portuguese version and are now popular there. But it’s fun to know that there’s still a Portuguese equivalent with fillings! Great recipe and can’t wait to try it! 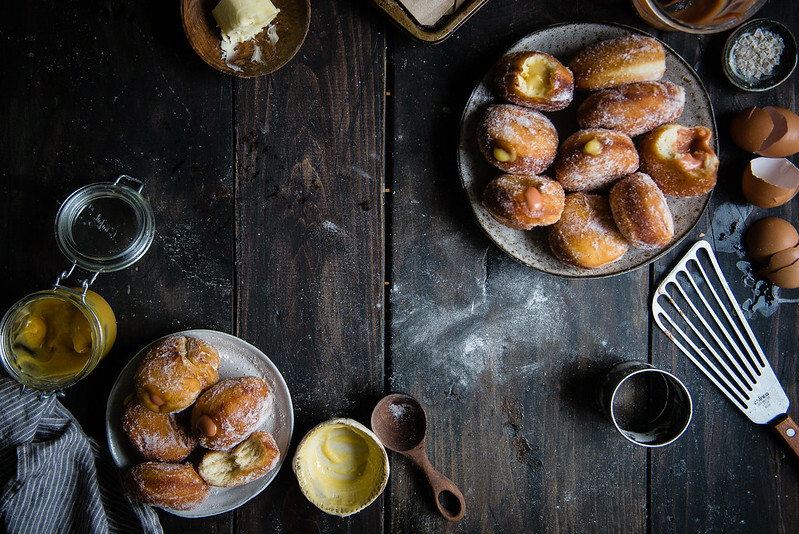 How many servings (malasadas) does this recipe yield?